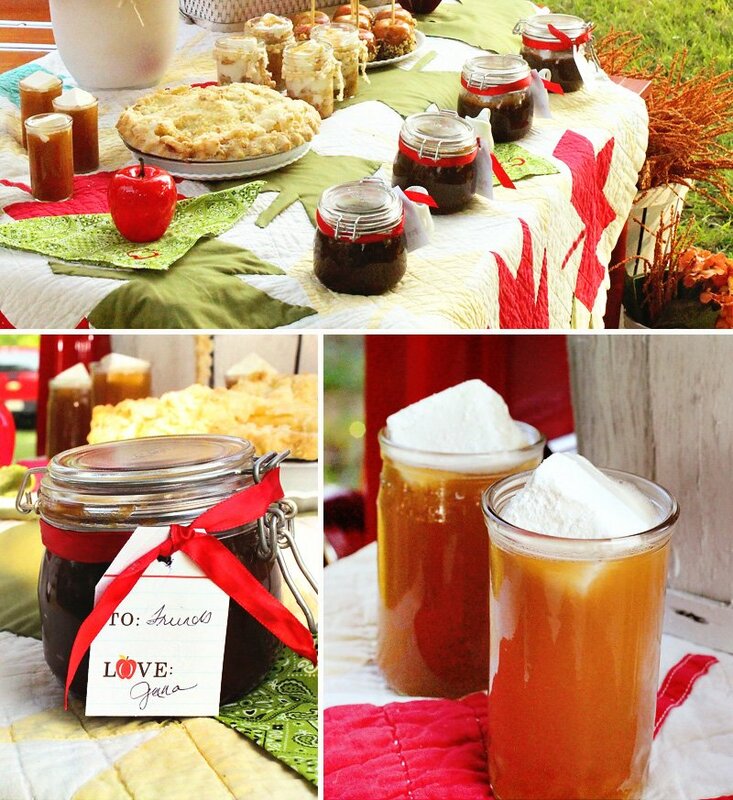 Fall is F-A-B-U-L-O-U-S and Brenda Byers of GreatStitch sure knows how to celebrate the season of crisp air, yummy warm cider and fresh apples galore – after all she grew up in an orchard! 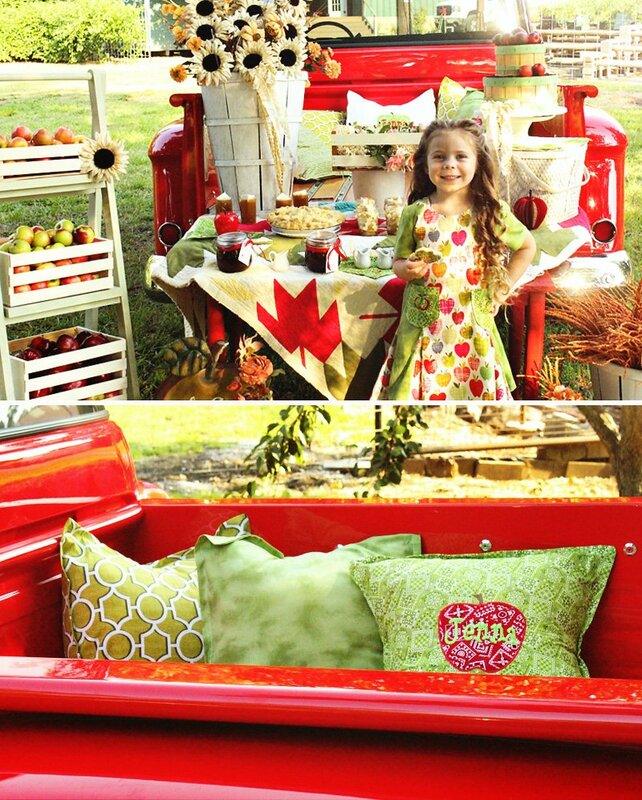 Her Fabulous Fall Apple Party & Truck Tailgate is a great idea for a birthday party, afternoon at the orchard or a fancied-up family get together. 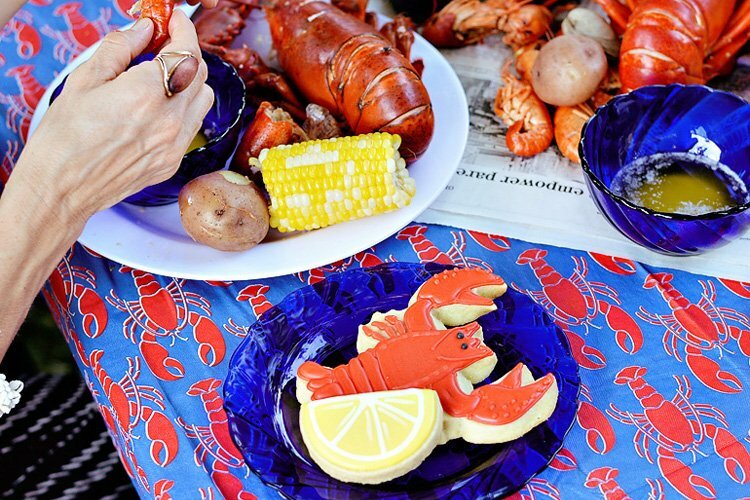 Look out for the comfy custom truck bed pillows, darling apple shaped cookies from The Last Course Bakery and more *freshly picked* ideas all covered in red! 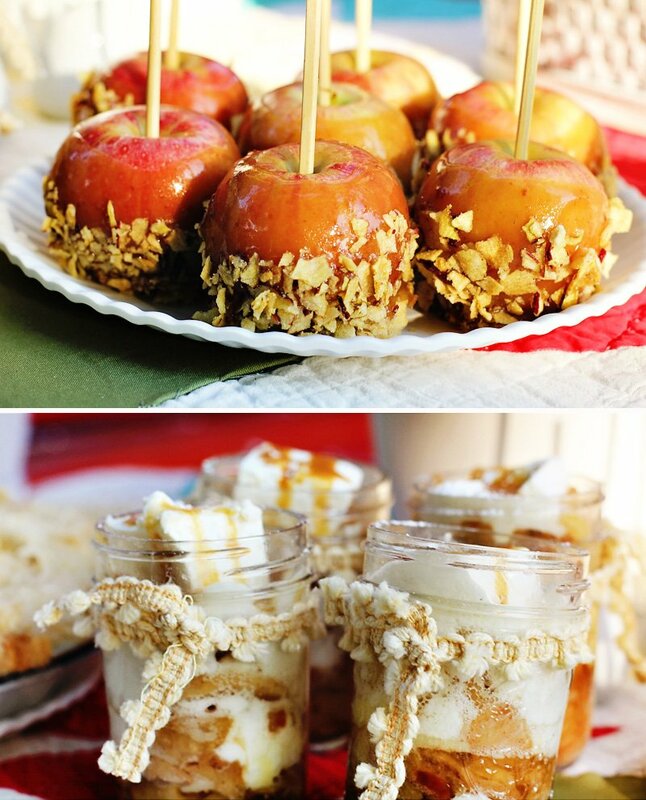 Fall means an Apple Party to me! Every apple is a precious commodity–not just a link to the past, but a testament to someone’s determination and foresight to plant a tree…and then wait, and wait some more, then work harder than you could imagine you would need to work. Pruning, thinning, fertilizing and pest control (even the bird’s can be a problem in an orchard). In the end you get these marvelous apples. I had the privilege of growing up in an apple orchard with dozens of trees surrounding our house. 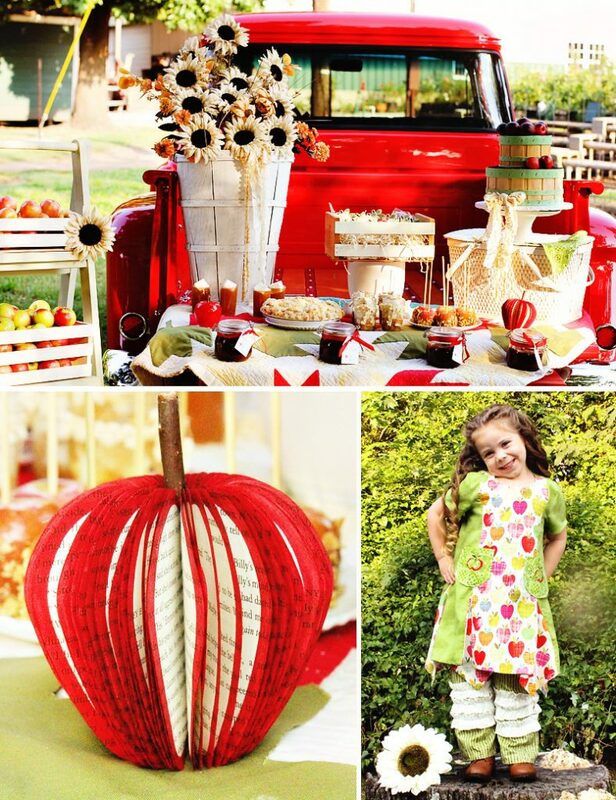 So when it came time to do a Fall party for our little friend Jenna, I knew we just had to do an apple themed party–and I’m so excited to share it with you. 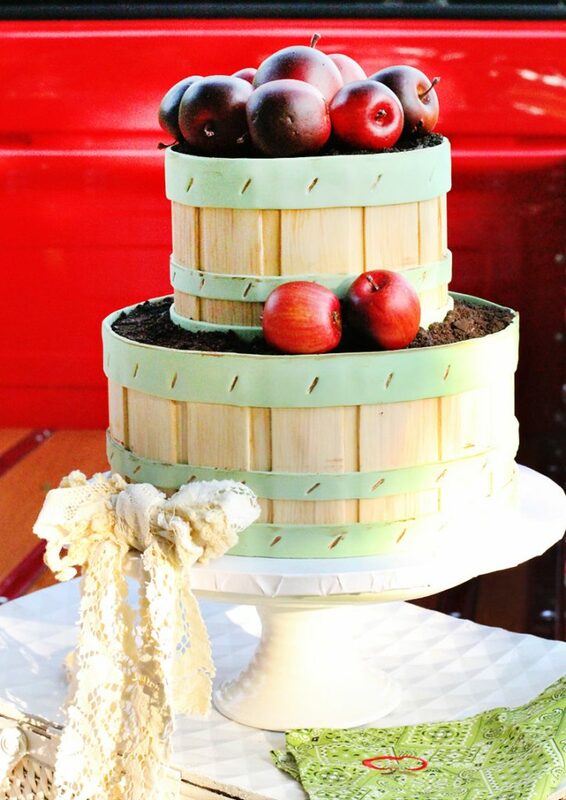 This cake looks like an apple barrel to me…Right down to the staples! And who made that Apple Barrel cake you ask? Why none other than the talented All Things Cake Shop. This gorgeous truck we parked at Roses, Inc. They have a whole farm dedicated to Roses. She had an apple tree on her farm rose farm and she let us borrow it for this party. Once we had a tree, we needed a truck. And this truck is one of the best I have ever seen. Jerry Enron was kind enough to let us set up on his wood and chrome truck bed. It seriously took my breath away it was so pretty! We found him at a car show that they have every Tuesday night here in Tulsa at McAlester’s on 91st and Memorial. His was my favorite! For our apple accents we found this gorgeous hand blown glass at Tazza Glass! During party time it is always fun to get the mail. The first package that came was cookies! Michele at The Last Course Bakery is such an artist with her frosting! 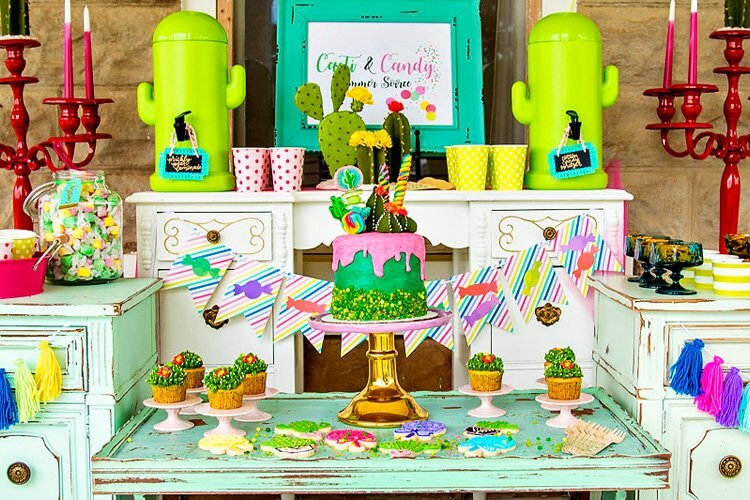 I love the way she matched our inspiration fabric perfectly! Jenna fell in love with this apple cut out of a book, she was trying to read it! You can find them at Created By K Mah. Don’t you love the joy on this kid’s face? 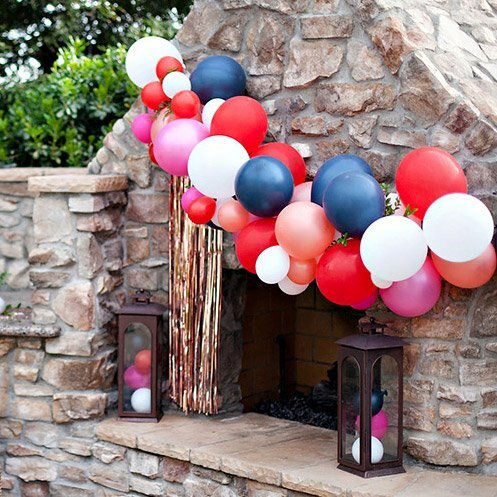 It was one of the most fun parties we have done because of the happy kiddo! When we plan something, I like to start with the fabric first. I learned the hard way that you can’t just go out and match something. There are specific colors that the fabric world uses and you have to follow those rules or you might end up needing something that doesn’t exist! So when I found the apple fabric for this little dress I knew I hit the jackpot. How could you go wrong with apples having a funky plaid! 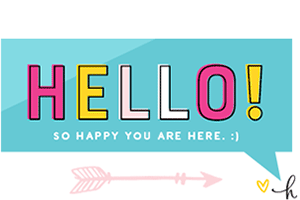 Anders Ruff does brilliant printables. 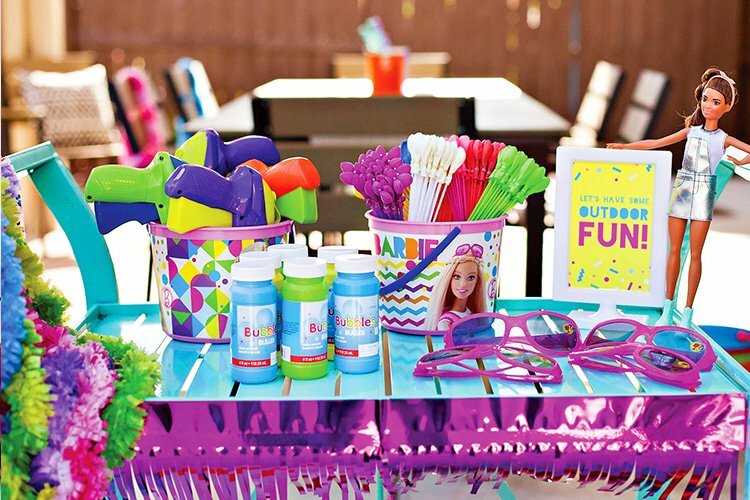 The back to school designs were perfect for this party! She added the cross hatching like the fabric print. Plaid is everywhere this year. It’s much better I think with a little funkiness like she has done in these water bottle wraps. 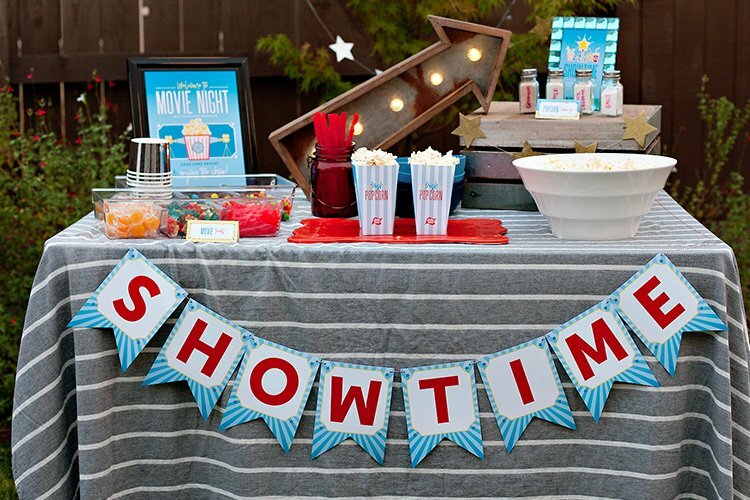 Printables add so much to any party! My kids have great memories of their grandmother reading to them, so we used some of those books in our party. I always told my kids that you can learn anything if you know how to read! We also used a quilt from their great grandmother in this shoot. The leaves are beautiful in this fall quilt. I do love a good caramel apple. I came up with the idea of using some dried apple chips on this project. We dipped the caramel in them after it was on the apple and it added a lovely layer of apple flavor. The caramel marshmallows are made out of caramel candies.They were good in these little jars layered with apples. They melted just enough to make it like it was a cloud. They were also melting in the cider…oh boy. Can’t hardly stand the thought of that even now. It was so good…drizzle a little caramel over the top…mighty nice! Love these Anders Ruff labels. 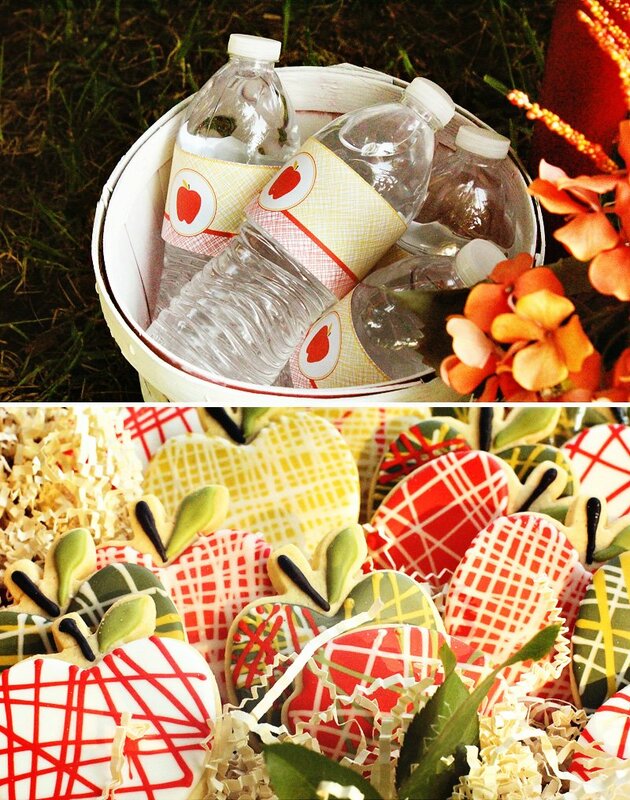 They were perfect for our apple butter gifts! Chex mix with Cinnamon made a wonderful “puppy chow” mix. Just melt white chocolate and pour it over the Chex. We drizzled caramel over that. then added apple chips. 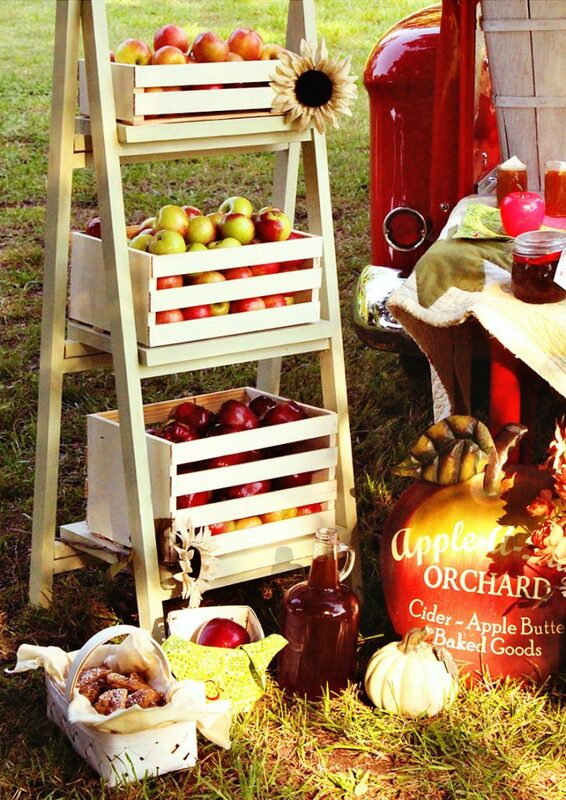 To me it wouldn’t really be Fall without apples of some kind—apple crisp, apple pie, caramel apples, apple butter, fried apples and oh so much more. 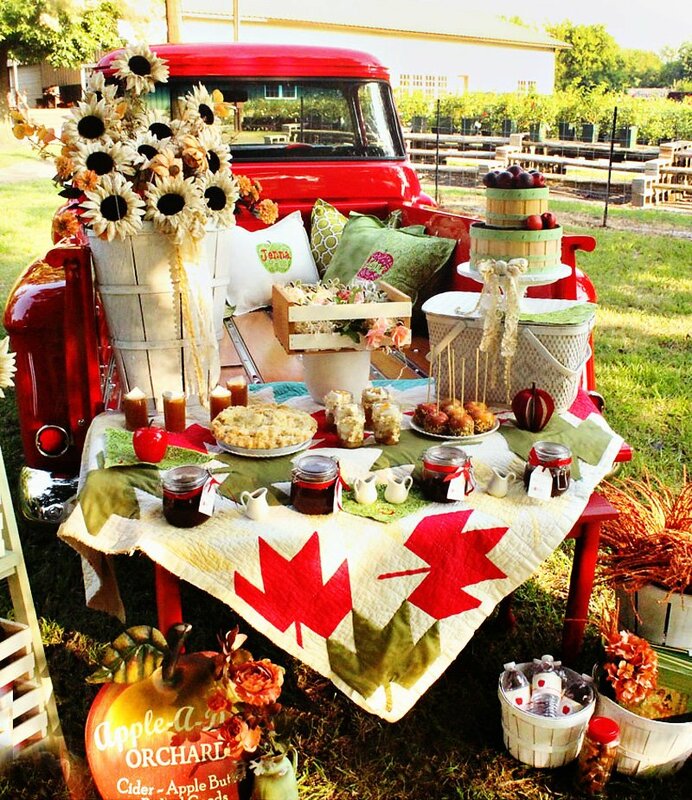 Those memories of Fall apples gave us the theme for Jenna’s special Tailgate Apple Party.